We’d love your help. Let us know what’s wrong with this preview of Zombies, Run! The Way of All Flesh by Naomi Alderman. Published August 8th 2016 by Zombies, Run! and Audible, Inc.
To ask other readers questions about Zombies, Run! The Way of All Flesh, please sign up. Nothing like a murder mystery in the midst of a zombie apocalypse. This was nice as an extension of the story told in the Zombies Run game. I really love the app, and therefore enjoyed this story quite a bit, but I am sure that if I wasn't a fan of the world and characters before, I'd have found this one a bit lacking. You can easily understand it without knowledge of the app, but the murder mystery wasn't enough of a puzzle to work through to work like "Columbo" for example, and the zombie side of the story was so little it doesn't work too well as fantasy eith This was nice as an extension of the story told in the Zombies Run game. You can easily understand it without knowledge of the app, but the murder mystery wasn't enough of a puzzle to work through to work like "Columbo" for example, and the zombie side of the story was so little it doesn't work too well as fantasy either. As usual with the app things get resolved rather quickly, and that works well with the app as it's usually about a 30 minute mission, but as a stand alone story it all felt a bit too easy and too abruptly in the end. I loved this. It was nice hearing from these characters and the story was engrossing and well written. It was super well acted and as always with the Zombies Run products (from apps to races, other things) made me excited to hit the road again and hear more of this world. This review has been hidden because it contains spoilers. To view it, click here. 3.5 Audiobook. Good twist on a Christie-esque murder mystery! I did enjoy this and I didn't mind that it was short and sweet. The sound effects and audio were good and I didn't think it was predictable. I also think a lot was covered in a short period of time. My only criticisms were that there wasn't as much zombie action as I was hoping and some of the voice actors sounded similar. I also found Jodie's accent a little anno 3.5 Audiobook. Good twist on a Christie-esque murder mystery! This review has been hidden because it contains spoilers. To view it, click here. As a Zombies Run fan, this is a great audiobook. If you’re not a fan of the running app, you will likely have little interest in this. So my review is from the perspective of a fan. Overall, this is a fun listen. It’s short, so an easy listen in a day or two. There’s two characters from the running app who serve as main characters, Chris and Jody, so the audiobook is set before the running app Season 1 starts. There’s other snippets that confirm this, but I won’t spoil those bits. 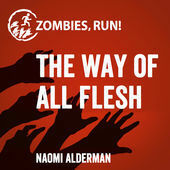 As a US listene As a Zombies Run fan, this is a great audiobook. If you’re not a fan of the running app, you will likely have little interest in this. So my review is from the perspective of a fan. Overall, this is a fun listen. It’s short, so an easy listen in a day or two. There’s two characters from the running app who serve as main characters, Chris and Jody, so the audiobook is set before the running app Season 1 starts. There’s other snippets that confirm this, but I won’t spoil those bits. As a US listener, it can be difficult at times to understand some of the various accents of the characters, especially when they talk fast or use regional slang. I have to keep the audio speed at 1x or lower (I’m normally listening at a min of 1.25x speed) to make sure I understand what’s being said. That really the main reason I docked this 1 star. I absolutely love the Zombies, Run! app. To me it's one of the most perfect pieces of media: immersive, motivating (it gets me running, so good job), and the world & story building is interesting. Amazing characters. Plot twists. I love it. The Way of All Flesh is a tie-in audio book... although it's not so much an audio book as it is a podcast/audio drama. No narrator, just on point voice acting. All the more reason for me to love it tbh. Plotwise it's a pretty decent murder mystery, but wha I absolutely love the Zombies, Run! app. To me it's one of the most perfect pieces of media: immersive, motivating (it gets me running, so good job), and the world & story building is interesting. Amazing characters. Plot twists. I love it. The Way of All Flesh is a tie-in audio book... although it's not so much an audio book as it is a podcast/audio drama. No narrator, just on point voice acting. All the more reason for me to love it tbh. Plotwise it's a pretty decent murder mystery, but what does it for me is the A+ audio production and the fact we get to hear some familiar characters. Zombies, Run! The Way of All Flesh was a fun listen, not great but not terrible either. I enjoyed the premise, a group of apparent strangers end up seeking refuge during the zombie apocalypse and discover they are in the company of a murderer. The episodes contain a range of special effects that pull you into the story. The narrators were good for the most part, though some the characters were a bit over-the-top and cheesy. I enjoyed the audiobook a lot more when the action doesn’t focus on the zombies but rather the murder, the secrets these not-so-randomly thrown together people are keeping and the tenuous threads that link them. Six episodes, full voice acting, by the wonderful Naomi Alderman. Old-school murder mystery in big rich mansion - what's not to like? Perfect supplement to the Zombies, Run! app storyline! So entertaining! I listened to this way back when it first came out, and decided I needed a relisten. It's even better the second time around, especially now that I'm re-meeting some of these characters in the game. I really loved this. Brilliant. Love a good twist at the best of times never mind one that combines my two favourite genres crime and zombies. Brilliant. Locked room murder mystery complete with a colorful cast of characters...and the ever looming threat of the undead. You'll not need to have played Zombies, Run! at all to follow along, but it just adds to the enjoyment when you recognize a few voices from Abel Township.